UK Radio Scanning Forum • View topic - PSK-31, etc., on 10m/11m? I'm considering jumping on the PSK-31 bandwagon, because it seems to be possible to get decent distances with relatively low power operation and comparatively poor propagation conditions. There seems to be a lot of PSK-31 activity in Europe on 20m; in fact, I can receive and decode conversations from all around Europe just using my laptop and my Tecsun scanner with its built-in antenna. I guess that's what working with a computer at morse speeds does for us. For reasons that I've moaned about elsewhere, I probably can't afford afford a 20m transceiver, so although I can listen, I can't talk. I can, however, afford a cheap Chinese 10/11m transceiver, with SSB support, etc. However, I can't pick up any PSK-31 or similar on the 10/11m bands, even though there is notionally a centre of activity at 28120 kHz. I don't know if that's because of propagation conditions, inadequate gear, or there's simply nobody there. I do pick up speech on SSB in this area -- not a huge amount, and not all the time, but some. So: does anybody know whether anybody in the UK or Europe actually uses the narrow band digital allocation around 28070-28190 ? Or anywhere else in the 10m/11m area? Re: PSK-31, etc., on 10m/11m? 11 meters is CB & I know some do digi as some fool CB'er was spotted pirating the amateur radio band recently.. The digi band for the amateur radio 10 meter band is 28070 to 28190. Each band is cut up into sections, with CW, digi, QRP all mode etc having at the least a centre of operation, so that people know where to look & to try & stop a free for all. You problem is not going to be do people use digi on 10 meters, but do enough people do it often enough to make it worth doing. The amateur radio bands are not like CB, we have lots of choices & plenty of different bands to use, why would someone sit on 10 meters, when conditions are better on 15, 20, 17 or even 40 meters? During contests where people get extra points for contacts on different bands, you will find 10 meters comes to life. But that is not every weekend. 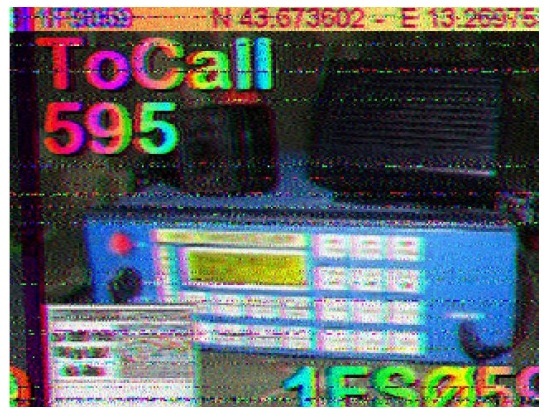 The above CB'er was not only using SSTV complete with his Latitude & Longtitude, he was also operating out of band & thus pirating on the Amateur radio band. "The amateur radio bands are not like CB, we have lots of choices & plenty of different bands to use, why would someone sit on 10 meters, when conditions are better on 15, 20, 17 or even 40 meters?" Good point; but I suppose one reason to do so is having the equipment, and not having space to put up an antenna that will be much use on > 10m or so. Or so it seems to me. Is it possible to make a reasonably efficient antenna for 40m (or even 20m, for that matter) that can be poked up above the roof-line of a suburban terraced house, without attracting the wrath of the neighbours? I'm pretty-much limited to antennas that can be pushed up on a pole. My garden is less than 10 meters by 8 meters & I work 80 meters & up. My biggest issue is not space, but local QRM I am surrounded on all sides by houses & flats & on one side by houses & a tree covered hill. To add to that my location is one of the lowest local spots with land rising on all 4 sides so VHF is poor here too. My 40 to 6 meter Off Centre Dipole which I have zigg Zagged around the loft is only around 10 meters long & if it were in the garden & not at twisted it would not need an ATU on 20 to 6 meters. To most members of the public a length of wire in the air is as good as invisible & with books like the ARRL's Low Profile Amateur Radio getting ideas for how to operate in an unfriendly urban environment is not hard. A 10 meter fibreglass roach rod can be ground mounted for a very efficient 40 meter quarter wave. The following is a nested vertical for 20 & 10 that is easy to build. Yeah. I have all those problems, plus the additional ones that I have no attic (it's a bedroom) and my back yard is actually a railway embankment. But -- mustn't grumble -- I do at least have a back yard; I have a friend who is trying to operate out of a one-bedroom, 2nd-floor flat. The back yard is only about 10ft wide, but it's 60ft long. I could notionally run a half-wave dipole for 40m or 20m along the garden, BUT... because it's a railway embankment, if one end is 40ft above the ground, the other end is only 8ft above ground. I could put a mast at the "high" end, which would give a sort of sloping dipole. An end-fed long wire is also a possibility, but I've never really figured out how RF grounding on those things is supposed to work. My worry is that, although I like to experiment, all the approach that I can see standing any chance of working need considerable constructional effort, much of it at height. I'd be loathe to undertake something like that without reasonable confidence of success. In short, I'd love to know how you can 40m-6m with a 10m-long antenna, and what equipment you need to tune it. I like to play with various small antennas & the best I have found is MFJ's small loop tuners. They are not cheap, but I have had some really good contacts on 20 & 17 using them. I brought a cheap--ish MFJ-933 & then when the opportunity arose months later the plastic cross & antenna kit that goes with it. Due to Ground linking, they are not ideal at 40 meters & down, but 20 to 10 meters they really are a very good option. Thanks. That's a very interesting little gadget although, as you say, it isn't cheap. Can you put the wire loop up in the air and run a feed to the tuner, or do you have to have it corrected directly? The wire is a small loop, so the wire will also be close to the tuner with both ends connected to the tuner. 4 feet of wire is needed for a 10 meter loop & 13 feet is needed for 20 meters so a wire hung over a door is all that is needed. I have even laid the wire on a bed & had reasonable results. The tuner will handle 100 watts, but is VERY sharp, so tune & retune as you increase power. The small loop tuner is no DX machine, but it is a great alternative to other small options & is cheaper than a magnetic loop.